As you’ve read in other blog posts here, research shows that friends are a vital in so many ways to our wellbeing. But an understanding of what it means to have close or best friendships is less clear. As the Science of Friendship’s Chief Ally, I am collecting these stories via an online survey and will report back what I learn from all of you here at the SoF project. If you are over 18 years old, click on this link to go right to the survey and begin: http://bestfriendstudy.questionpro.com. Thanks for helping The Science of Friendship project continue to grow. In 1977 George Engel, a psychiatrist, introduced a concept that shifted the medical model away from a strict focus on pathology toward a more nuanced and complex formulation of human illness and health: the biopsychosocial model. What this model promotes it a consideration of the multiple factors that influence a person’s health and well-being, including biological, psychological, and social factors. Increasingly, since the advent of this idea, healthcare practitioners are moving away from the strict treatment of isolated symptoms and exploring how things like lifestyle, diet, relationship, beliefs, and even the way a person sits while driving a car can impact health. For example, a patient reporting an upset stomach may indicate that the person has contracted a parasite or some kind of infection. But a stomachache may also be a result of too much stress on the job or the outcome of an unresolved fight with a best friend. Within the biopsychosocial model, all of these factors would be examined before a treatment plan would be implemented. This model also exemplifies how influenced we are, as individuals, by those around us: family, friends, colleagues, and even consequential strangers. 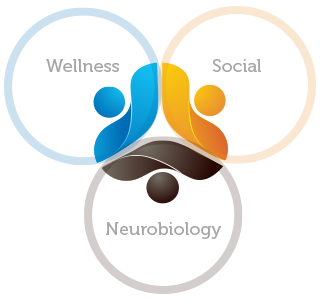 Rather than being static, isolated bodies that develop disease, the biopsychosocial model focuses on interconnectivity, multiple pathways to both disease and health, and the dynamic nature of human experience. Within this new worldview of medicine, scientific research has demonstrated that our brains are biopsychosocial organs and wire us to those around us into an ever-evolving web of social relations. Our social brains are wired for connection and social interaction. Although people have often dismissed online social media as the domain of the lonely, or an escape from the deep connections made in the “real” world, our most recent data over at the Science of Friendship project pokes holes in that assumption. People are not only making friends online, they are making deep and meaningful friendships. Over 68% of those surveyed* made a friend they considered a close friend in the last year, and over 80% of those close friendships were made online. That’s over 54% of people who made a close friend online in the last year. Think about that. This was barely an available option merely 10 years ago. To us at the Science of Friendship that is a staggering finding and begs a number of questions. Is social media enabling people to form friendships faster? Does this mean that people have more friends than they used to? Are these friendships different from those formed in the real world? and how so? Are the lonely people still lonely? These are questions we’ll be answering down the road. For now, we’ll be tackling what our most recent data can answer. While 63.7% of our respondents reported being single, and 12.1% divorced, many of them are far from lonely. You may notice from those last two numbers that this places the majority of our respondents in a “not romantically attached” category. What is surprising to note about this group, however, is that for them, creating new and deeper friendships is a more important driver for using social media over romantic relationships or hooking up. In fact, 89.1%, cited making new friends as their chief motivation for using this social networking site. Surprising? It was to us. What is motivating this change in how we connect and build friendships? In one way it is completely logical. Online we can explore many personal and behavioral aspects of potential friends before reaching out to one another, making it more likely that we will get along. In our paper on The Mechanics of Friendship “Like Meets Like: Sameness in Friend Formation” we already illuminated that contrary to popular opinion it is sameness, not opposites that attract. In addition our respondents are highly transient. Over 50.4% have moved over 5 times, and 19.2% over 10 times in their lifetime. This level of mobility almost necessitates using various digital communication mediums to keep up former friendships, as well as help make new connections. However, not all of that moving is very far. Over 60% live in the state where they were born. Of our respondents, 43% of people live within 10 miles of the person they consider their Best-Friend. This does not mean, however, that digital media is not used to bolster that relationship. When asked how they keep in touch with their best friend, in-person visits were at 53.3% and online social networks 51.3%. Texting, with an incidence of 68% was the most prevalent way they kept in touch with each other. This gives credence to the number of apps that are being designed to capitalize on Social, Mobile & Local (SoLoMo). Perhaps the most telling sign that social media, with its ability to self-select who we connect with based on similar attributes, helps foster deep friendships is that 78.6% reported having met at least 1 close friend online and 29.5% reported making 4 or more close friends online. It is truly being used for social discovery and making new friendships, not just bolstering old ones and finding long-lost friends. Never before have we had such a powerful tool for peering into the day-to-day lives of people we know or want to meet. Our online interactions and exploring new connections help fill in the gaps to ease creating new friendships. It tells us a lot about people we are interested in, and when it tells us something that we personally relate with, we grow more attached. This is the Science of Friendship at work. Many people believe friendship is almost random circumstance, the result of physical proximity, combined with common interests and good timing. The common interests portion is correct, but we are no longer beholden to being within 2 feet of someone to connect, and that is all the traditional mode of making friends has been; 2 feet. All of the stories of fated friendships, and most of the people you currently consider friends are based on being within 2 feet at a particular place at a particular time. It is no wonder that we turned to the idea of “fate” to explain it. Social media is not just about connecting us across vast distances, it also enables connecting with someone down the street who you’ve never met. Who knows? They could be your next best friend. What would you like to know about how friendship is changing? Have you met a close friend online in the last year? And how did it differ from initially meeting someone in the real world? Comment below and we’ll seek to answer your questions. We are The Science of Friendship project. Making friends in the real world in real-time is something that most of us learn very early in life, and was the basis for the Mechanics of Friendship paper (Brooks, 2012b). We have millennia of opinions, and decades of empirical research, about face-to-face friendship. In the last decade, however, we have just begun to understand our virtual friends—how we make and keep friends online, how we interact with them, and the benefits of an increased social network. While early research on social network sites (SNSs) suggested that we may more-regularly interact with existing, offline friends via SNSs (Ellison, Steinfeld, & Lampe, 2007), creating new connections online or solidifying tentative connections made offline, thereby increasing a person’s bonding and bridging social capital, is also important. Understanding the importance of social capital, or the resources a person can rely on for personal and social support, offers insights into the importance of social contact to maintain social ties. Higher levels of social capital have been linked to many benefits such as greater commitment to community and psychological well-being (Ellison et al., 2007). Research related to the impact, effects, and benefits of making and maintaining friends via online social media, what we refer to as the Science of Online Friendship, in many ways, challenges three common cultural internet memes which have sprung up in the past several years, each of which are explored below. The term friendship when used in casual conversation may conjure an image of an individual, say, a best friend, or a small group of tightly knit people who are a person’s core group. Even though the definition of what constitutes a best friend varies widely in the social science literature, most individuals know if they have a best friend. That person is a confidant, the person we call in times of need and times of celebration, and a person with whom we have history and trust. As we progress towards a more fluid transient culture, what are the effects on one of the most stabilizing forces for society, friendship, and how can technology adapt to meet that need? Friendship is not a static concept, but an ever-changing, crucial part of human experience across time and culture. It is a reciprocal form of connection and interaction. Throughout out lives, we experience a variety of relationships: parents, siblings, romantic partners, and friends. According to a pair of leading social scientists, a “relationship refers to a pair of persons who are interdependent with each other, that is, each person affects and is affected by the behavior of the other person over time” (Collins van Dulmen, 2006). The idea of relationship, in this context refers primarily to the intimate connections in our personal lives, while nonetheless, some individuals also consider close colleagues at work or in civic situations as friends as well. Thus, the concept of friendship is an ever-changing, yet crucial part of human experience across time and culture. Ancient Greek philosophers wrote about its importance: Holmes and Greco (2011) noted that, “Friendship is not only a ‘virtue,’ according to the Greek philosopher Aristotle, but a social practice: a social relationship between two individuals who freely choose and mutually trust each other” (para. 1.1). We are born into a biological family, but we have the power and freedom to choose our friends; to affiliate with and spend the majority of our social time with individuals picked based upon something like a common interest or successful mutual emotional support (Peel, Reid, Walter, 2009). All evidence suggests that we are Wired for Friendship. From evolutionary biology, to neurosciences and social networks, our existence in part is defined by how we relate to others. It has been shown to affect how physically healthy we are as individuals, and it shapes our psychological outlook on the world and how satisfied we are with our lives. Is the glass half-full, half-empty, or do we even have a glass? Friendship helps decide that for us. So when our society is changing in a way that affects Friendship, what are the implications? Our increasingly mobile (as in moving somewhere else) and live-alone society has caused difficulty in maintaining the types of deep, long-lasting Friendships that act as stabilizing forces in our lives. It is no wonder that some view that we are devolving socially. The concept of friendship has changed. What are the social implications in a world where friends are often made virtually without ever having met? How do the bonds between people change? and what are the implications for our society? Are we spiraling down into a huge dark anonymous abyss where the bonds of friendship and all relationships are transient, or is this the beginning of a new shared and open culture that will fundamentally change the way we define, interact, and view relationships? What does it mean to be a… friend? And what does this changed and ever-evolving dynamic mean to consumer brands, social marketing, and the future of shopping? Welcome to The Science of Friendship project. We hope you enjoy the time you spend being in inquiry with us.